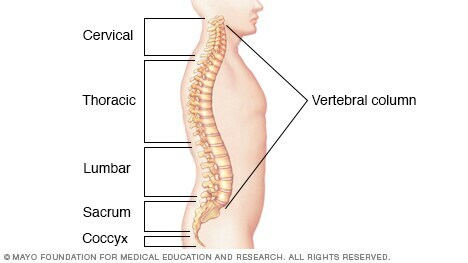 Your spine is made up of 30 bones stacked in a column. Each of these bones is called a vertebra. From the side, your vertebral column has a natural curve toward the back of your body as it passes through your upper chest, balanced by a similar curve toward the front through the lower vertebrae. Joints between the vertebrae in your neck enable you to tilt, rotate and flex your neck. Joints between the larger vertebrae in your lower back (lumbar spine) enable you to bend, turn and twist at your waist.